TV show dates: September 29, 2017 — November 20, 2017. Performers include: Anson Mount, Iwan Rheon, Serinda Swan, Eme Ikwuakor, Isabelle Cornish, Ken Leung, Ellen Woglom, Sonya Balmores, and Mike Moh. 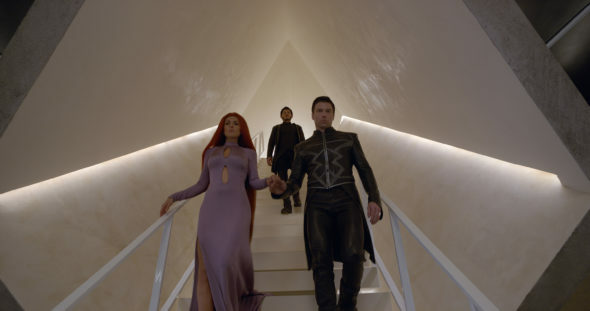 Created by Scott Buck and based on the Marvel Comics by Stan Lee and Jack Kirby, Marvel’s Inhumans TV show explores the Inhumans’ Royal Family. The sci-fi action adventure drama centers on the mysterious Black Bolt (Mount), King of the Inhumans, whose voice is so powerful that even his mere whisper can wipe out a city. When the Royal Family of Inhumans is fractured by a military coup, they make a hasty escape to Hawaii. While attempting to reunite, they interact with humanity in that bit of paradise and may just happen upon a way which saves themselves and Earth, as well. Capable and charismatic, Maximus (Rheon) is intensely dedicated to the people of Attilan. The only thing that challenges his loyalty to his brother, the King, is his fervent desire to ascend to the throne. Above all, Black Bolt trusts his wife Medusa (Swan), Queen of the Inhumans. A formidable warrior in her own right, Medusa can manipulate her hair the way most people use their hands. Queen Medusa’s sister, Crystal (Cornish) is the baby of the Royal Family. While she is impulsive and self-reliant, family means everything to her. Crystal has the ability to control the elements: fire, earth, water, and air. Cool, calm, and collected, the athletic Triton (Moh) is a cousin to the King. Thanks to his inhuman gifts, he is able to live underwater. Another of Black Bolt’s cousins, Gorgon (Ikwuakor), heads up Attilan’s military. Possessed of powerful legs and hooves, Gorgon can trigger an earthquake with a stomp. He finds it much easier to wage war than to solve his problems through less violent means. Yet another cousin, Karnak (Leung) is a close advisor and devout supporter of Black Bolt. This philosopher and skilled strategist can spot faults in everything from people, to plans, to buildings. He is the yang to Gorgon’s yin. Another loyal devotee of King Black Bolt, Auran (Balmores) heads up the Royal Guards. Finally, there is Louise (Woglom). This intelligent, focused woman works at a private aerospace company. She is passionate about all things pertaining to the moon, as well as space writ large. In trying saving themselves, can this super-powered band of Inhumans also save mankind and the Earth, itself? Stay tuned. It’s brother versus brother as the final showdown between Black Bolt and Maximus takes an unexpected turn – one with lasting consequences for all of Inhumanity. First aired: November 20, 2017. What do you think? Do you like Marvel’s Inhumans TV series? Should this TV show have been cancelled or renewed for a second season on ABC? Please Renew Marvel Inhumans I loved it. I think it should have been renewed. Please save Marvel’s Inhumans show. I really like this show and I watch it with my son. There aren’t many shows out there now a day that I can watch with my kids, they are either mindless or they are not suitable for tweens, but this one is good and we love superheros of all kinds! Please don’t cancel it!